Carolyn of Juggling Frogs has a very interesting DIY section. 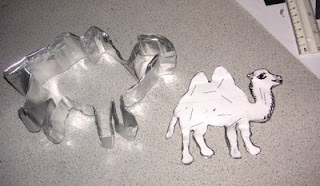 One of my favorites is making cookie cutters from clipart and foil pans. She also shares some downloadables. Check out the trends page of Burda Fashion. My favorite is the slideshow from the catwalks. In the creative ideas section there are downloadable patterns for registered (free) users. It's been awhile since I've had time to post. I'm working on a very large project that I'll be able to talk about after next week. Bear with me, I have lots of goodies and fun coming up. Christine Cox, owner of Volcano Arts, publishes an e-mail newsletter that's one I always find interesting. This month there is this tutorial regarding jump rings. It's the finishing skill that elevates my jewelry making and is really difficult for me to do well.